Tidepool Tim lives on Cobscook Bay in Maine. He knows where and when to find over 200 species of sea life that inhabit the ocean at his doorstep! Watch Tidepool Tim ‘tidepooling’ videos. Learn about the marine biology of Maine by seeing for yourself! Green crab army attacks a clam mudflat! 15 foot long sugar kelp. Like eating clams? Ever wonder how the clam digger finds them - look for the holes! Join Tidepool Tim of Gulf of Maine, Inc. as he wanders around the clam flats in awe of the thousands of clam siphon holes that he sees there. Listen to the sound of the clams squirting as they retract their siphons, and see the signs of raccoons as they prey on clams in the night. 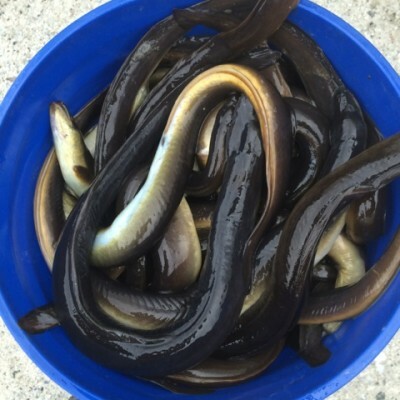 Elvers, or glass eels are found 'running' from the sea, up the watershed through brackish rivers where they are harvested by local fishermen in nets. A lion's mane jellyfish brought to the surface by a rising current. Sharks are apex predators at the top of the food web. They monitor marine species abundance, affecting carnivores, herbivores, and autotrophs. The tooth on the left side of the image has one root, and the molar on the right has three. The teeth are each made from the same materials distributed differently: enamel, dentin, and cementum housing a pulp cavity. Shark scales (placoid scales) and shark teeth are made of the same materials and have the same general structure! Tidepool Tim has collected a bucket of different starfish - each with regenerating arms (rays). See the variations in the size, and regeneration abilities of these Northern Sea Stars, Asterias from coldwater atlantic habitats. Tidepool Tim takes a look at Soft Shell Clams. Learn about their thin shells, and long clam 'necks' or siphons. See the clam squirt water as it retracts its elephant like neck. Learn about low tide and see the dramatic difference in the amount of water that flows in and out of the tiny bay in Maine. See the companion video for High Tide on Sipp's Bay with Tidepool Tim.